Are you ready for Cycle 3 Art? Are you busy? Planning art projects that focus on the fundamentals (the grammar) of art takes hours of time. However, there’s no need to spend your limited free time reinventing the wheel by writing art lesson plans. I want to give you my complete art lesson plans for your homeschool community so you can reclaim your time. No one wants to spend their evenings and weekends writing lesson plans. We all want to just relax… maybe read a book, watch our kids play soccer or chat with friends… But how can you relax with all these art projects hanging over your head? “What exactly are we going to do for art each week? How can I make this art project work for both 4 year olds and 12 year olds? How can we make sure we’re teaching some real art principles in such a short time block? What supplies should I purchase? I get it, I’ve been a Classical Conversations SR, Director, and Foundations tutor myself and plenty of my evenings and weekends have been anything BUT relaxing. However, this year, I finally created all my art lesson plans ahead of time and pulled together an organized, succinct shopping list before the summer even got into full swing! No need to re-invent the wheel- I’m sharing all my lesson plans with you here, so you can relax too! Check our our general CC page here for FAQs and testimonials from other happy CC peeps! Are you curious about what a Ridge Light Ranch art lesson plan looks like? 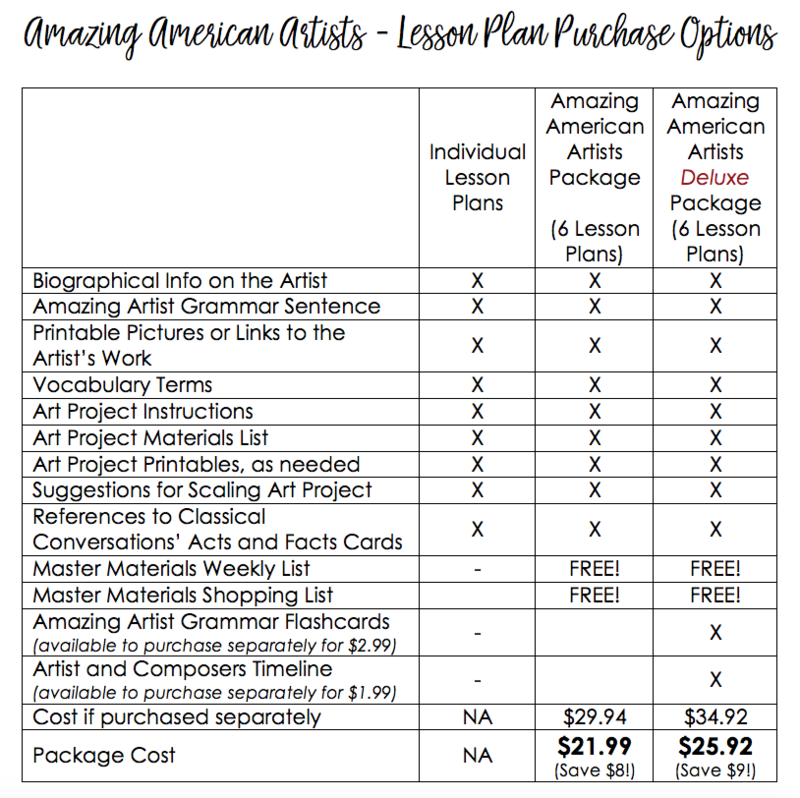 Download a sample art lesson plan here. If you’re curious about what supplies you’ll need to complete these lessons, you can download the Cycle 3 Amazing American Artists Materials List here.